Conservatives in the USA have been lying about the NHS on a massive scale. As Simon Hoggart comments today “There are few tribes more loathsome than the American right”. CRC Public Relations is a conservative PR firm previously known as Creative Response Concepts. ‘Creative’ appears to mean ‘lying’, but I guess that is what PR is all about. alternative medicine (a lot more on that coming up shortly). is an obscenity. The fact that over 40 million Americans have no insurance is an obscenity (see The brutal truth about America’s healthcare). Health spending as a share of GDP. Yes I know this is anecdote, but it matters a lot to me. I already posted a version of this story, but this seems like the time to repeat it. 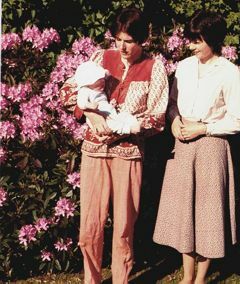 On December 13th 1984, my wife had a subarachnoid haemorrhage when she was seven months pregnant. After an initial misdiagnosis by an obstetrician at St Peter’s Hospital, Chertsey, she was moved to UCH and diagnosed very quickly. The next morning I was called to see the neurourgeon, the great Alan Crockard. He was sitting surrounded by medical students some of whom I’d taught the previous year. He told me my wife had had a subarachnoid haemorrhage (at 33!) and they would operate straight away. And “I have to ask you, if we can save only the mother or the baby, which shall it be”. It’s as well to write that down because even 24 years later I can’t say it without a lump rising in my throat. After a week in intensive care, under heavy sedation, Margaret’s blood pressure was not low enough and they decided to deliver the baby. 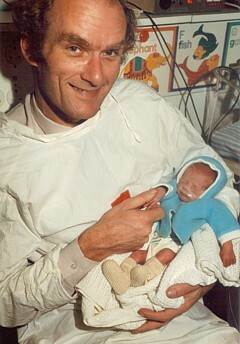 At about 4 pm on a snowy Christmas Eve, a team of neurosurgeons and a team of obstetricians gathered and soon after, Andrew Stuart Colquhoun emerged in a small incubator to be whisked off in an ambulance to the Special Care Baby Unit at UCH (run, at that time, by Osmund Reynolds). Christmas day was spent in the hospital, with Margaret’s mother. Andrew weighed 1.4 kg at birth, but by Christmas day he had pulled out his ventilator himself, and was doing fine. He was so tiny that it was a couple of days before I dared to hold him. The Unit had racks of doll-sized clothes, knitted by volunteers. The care was superb. Andrew (at 9 days) and Dad. Jan 2, 1985. Click for album. It is episodes like this that make one very proud of the NHS. She and Andrew were in hospital continuously for more than four months. Not a penny changed hands. Heaven knows what it would have cost in the USA, or even of insurance would have covered such a gargantuan bill. 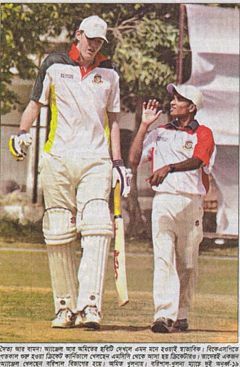 Andrew (left) playing cricket in Bangladesh, Feb 2005. My own experience is trivial compared with that of Margaret and Andrew, but it has been as near perfect as anyone could wish. I had a lumbar spinal fusion (L3 – L4) in 1995, after several attempts at less drastic solutions. I’ve had two artificial hips. They allowed me to walk across the Alps for my 65th birthday. Then a few trivial things like bilateral hernia and DVT (I had been scanned and was on anticoagulant therapy within 4 hours of walking into UCLH’s Accident and Emergency). And now it looks as though I’ll be getting a partial or total nephrectomy too. And not a penny has changed hands. Bush may have gone, but a large fraction of Americans seem to be unrepentant Bush-ites. Almost all of my many friends in the USA think more or less like I do. Even Obama is to the right of most European conservatives, The other 48% are to the right of Attila the Hun. The extent of the polarisation that still exists is nothing short of terrifying. Thanks to the great Aneurin Bevan who established the NHS in 1948 for ordinary people like me, in the face of fierce opposition from the medical establishment. Paul Krugman in the New York Times is magnificent as always. In The Swiss Menace he points out that Obama’s scheme is nothing like the NHS anyway, but more like that in Switzerland. The US uses the PSA blood test far more widely than we do in the UK – despite questions over how effective it is at spotting cancers that would actually kill, as opposed to those that cause no symptoms. As a result, the USA has one of the highest recorded rates of prostate cancer in the world. So although it’s undoubtedly ‘better’ at spotting prostate cancers, it’s also fair to say that some of these Americans will never die from their disease. This ‘overdiagnosis‘ inflates the survival statistics, at the expense of ‘overtreating‘ men – which is expensive and can cause long-term side effects (which can need further treatment). The Prince of Wales’ Foundation for Integrated Health (FiH) is a propaganda organisation that aims to persuade people, and politicians, that the Prince’s somewhat bizarre views about alternative medicine should form the basis of government health policy. His attempts are often successful, but they are regarded by many people as being clearly unconstitutional. “It is a shocking perversion of the real issues driven by one man; unelected, unqualified and utterly misguided”. We are promised some movie clips of the meeting. They might even make a nice UK equivalent of “Integrative baloney @ Yale“. This post is intended to provide some background information about the speakers at the symposium. But let’s start with what seems to me to be the real problem. The duplicitous use of the word “integrated” to mean two quite different things. One of the problems of meetings like this is the harm done by use of euphemisms. After looking at the programme, it becomes obvious that there is a rather ingenious bit of PR trickery going on. It confuses (purposely?) the many different definitions of the word “integrative” . One definition of “Integrative medicine” is this (my emphasis). That is a thoroughly admirable aim. And that, I imagine, is the sense in which several of the speakers (Marmot, Chantler etc) used the term. Of course the definition is rather too vague to be very helpful in practice, but nobody would dream of objecting to it. But another definition of the same term ‘integrative medicine’ is as a PR-friendly synonym for ‘alternative medicine’, and that is clearly the sense in which it is used by the Prince of Wales’ Foundation for Integrated Health (FIH), as is immediately obvious from their web site. “What is homeopathy commonly used for? But there is not a word about the evidence, and perhaps that isn’t surprising because the evidence that it works in any of these conditions is essentially zero. The FIH document Complementary Health Care: A Guide for Patients appears to have vanished from the web after its inaccuracy received a very bad press, e.g. in the Times, and also here. It is also interesting that the equally widely criticised Smallwood report (also sponsored by the Prince of Wales) seems to have vanished too). Conference chair Dr Phil Hammond, GP, comedian and health service writer. Hammond asked the FIH if I could speak at the meeting to provide a bit of balance. Guess what? They didn’t want balance. Michael Dixon is devoted to just about every form of alternative medicine. As well as being medical director of the Prince’s Foundation he also runs the NHS Alliance. Despite its name, the NHS Alliance is nothing to do with the NHS and acts, among other things, as an advocate of alternative medicine on the NHS, about which it has published a lot. Dr Dixon is also a GP at College Surgery, Cullompton, Devon, where his “integrated practice” includes dozens of alternative practitioners. They include not only disproven things like homeopathy and acupuncture, but also even more bizarre practitioners in ‘Thought Field Therapy‘ and ‘Frequencies of Brilliance‘. To take only one of these, ‘Frequencies of Brilliance’ is bizarre beyond belief. One need only quote its founder and chief salesperson. “The intent of a long distance Frequencies of Brilliance (FOB) session is to enable a practitioner to facilitate a session in one geographical location while the client is in another. A practitioner of FOB that has successfully completed a Stage 5 Frequency workshop has the ability to create and hold a stable energetic space in order to work with a person that is not physically present in the same room. The space that is consciously created in the Frequencies of Brilliance work is known as the “Gap”. It is a space of nonlinear time. It contains ”no time and no space” or respectively “all time and all space”. Within this “Gap” a clear transfer of the energies takes place and is transmitted to an individual at a time and location consciously intended. Since this dimensional space is in non-linear time the work can be performed and sent backward or forward in time as well as to any location. The Frequencies of Brilliance work cuts through the limitations of our physical existence and allows us to experience ourselves in other dimensional spaces. Therefore people living in other geographic locations than a practitioner have an opportunity to receive and experience the work. This is, of course, preposterous gobbledygook. It, and other things in Dr Dixon’s treatment guide, seem to be very curious things to impose on patients in the 21st century. In March 2006, a press release http://www.ubht.nhs.uk/press/view.asp?257 announced a randomised trial for homeopathic treatment of asthma in children. This was reported also on the BBC http://news.bbc.co.uk/1/hi/england/bristol/4971050.stm . I’d be very grateful if you could let me know when results from this trial will become available. I have just submitted the funders report today and we have set ourselves the deadline to publish two inter-related papers by March 1st 2007. I answered this question politely on the same day but nevertheless my innocent enquiry drew forth a rather vitriolic complaint from Dr Thompson to the Provost of UCL (dated 14 December 2007). In this case, the Provost came up trumps. On 14 January 2008 he replied to Thompson: “I have looked at the email that you copied to me, and I must say that it seems an entirely proper and reasonable request. It is not clear to me why Professor Colquhoun should require some special authority to make such direct enquiries”. Dr Thompson seems to be very sensitive. We have yet to see the results of her trial in which I’m still interested. and on Andrew Lewis’s blog. It seems that Peter Hain was converted to alternative medicine when his first baby, Sam, was born with eczema. After (though possibly not because of) homeopathic treatment and a change in diet, the eczema got better. This caused Hain, while Northern Ireland Secretary to spend £200,000 of taxpayers’ money to set up a totally uninformative customer satisfaction survey, which is being touted elsewhere in this meeting as though it were evidence (see below). I have written about this episode before: see Peter Hain and Get Well UK: pseudoscience and privatisation in Northern Ireland. I find it very sad that a hero of my youth (for his work in the anti-apartheid movement) should have sunk to promoting junk science, and even sadder that he does so at my expense. There has been a report on Hain’s contribution in Wales Online. Cyril Chantler is a distinguished medical administrator. He also likes to talk and we have discussed the quackery problem several times. He kindly sent me the slides that he used. Slide 18 says that in order to do some good we “need to demonstrate that the treatment is clinically effective and cost effective for NHS use”. That’s impeccable, but throughout the rest of the slides he talks of integrating with complementary” therapies, the effectiveness of which is either already disproved or simply not known. I remain utterly baffled by the reluctance of some quite sensible people to grasp the nettle of deciding what works. Chantler fails to grasp the nettle, as does the Department of Health. Until they do so, I don’t see how they can be taken seriously. I first met David Peters after Nature ran my article, Science Degrees without the Science. .One of the many media follow-ups of that article was on Material World (BBC Radio 4). This excellent science programme, presented by Quentin Cooper, had a discussion between me and David Peters ( listen to the mp3 file). There was helpful intervention from Michael Marmot who had talked, in the first half of the programme, about his longitudinal population studies. homeopathy and acupuncture, that proper testing has largely been done. The tests were failed. The University of Westminster has, of course, gained considerable notoriety as the university that runs more degree programmes in anti-scientific forms of medicine than any other. Their lecture on vibrational medicine teaches students that amethysts “emit high Yin energy so transmuting lower energies and clearing and aligning energy disturbances at all levels of being”. So far their vice-chancellor, Professor Geoffrey Petts, has declined to answer enquiries about whether he thinks such gobbledygook is appropriate for a BSc degree. But he did set up an internal enquiry into the future of their alternative activities. Sadly that enquiry seems to have come to the nonsensical conclusion that the problem can be solved by injection of good science into the courses, as reported here and in the Guardian. It seems obvious that if you inject good science into their BSc in homeopathy the subject will simply vanish in a puff of smoke. In 2007, the University of Westminster did respond to earlier criticism in Times Higher Education, but their response seemed to me to serve only to dig themselves deeper into a hole. Nevertheless, Westminster has now closed down its homeopathy degree (the last in the country to go) and there is intense internal discussion going on there. I have the impression that Dr Peters’ job is in danger. The revelation of more slides from their courses on homeopathy, naturopathy and Chinese herbal medicine shows that these courses are not only barmy, but also sometimes dangerous. I first came across Dr Fowler when I noticed him being praised for his teaching of alternative medicine to students at Barts and the London Medical School on the web site of the Prince’s Foundation. I wrote him a polite letter to ask if he really thought that the Prince of Wales was the right person to consult about the education of medical students. The response I got was, ahem, unsympathetic. But a little while later I noticed that two different Barts students had set up public blogs that criticised strongly the nonsense that was being inflicted on them. At that point, I felt it was necessary to support the students who, it seemed to me, knew more about medical education than Professor Fowler. It didn’t take long to uncover the nonsense that was being inflicted on the students: read about it here. 12:30 Educating tomorrow’s integrated nurses. As far as I can see, Donna Kinnair has no interest in alternative medicine. She is director of nursing at Southwark primary care trust and was an adviser to Lord Laming throughout his inquiry into the death of Victoria Climbié. I suspect that her interest is in integrating child care services (they need it, judging by the recent death of ‘Baby P’). Perhaps her presence shows the danger of using euphemisms like ‘integrated medicine’ when what you really mean is the introduction of unproven or disproved forms of medicine. DC’s rule 2. Never trust anyone who uses the word ‘paradigm’. It is a sure-fire sign of pseudoscience. In this case, the ‘new paradigm’ seems to be the introduction of disproven treatment. Dooley is a gynaecologist and Medical Director of the Poundbury Clinic. His clinic offers a whole range of unproven and disproved treatments. These include acupuncture as an aid to conception in IVF. This is not recommended by the Cochrane review, and one report suggests that it hinders conception rather than helps. Ireland experience: what has it shown us and what are its implications? This claim appears, prima facie, to breach the Unfair Trading Regulations of May 2008. The legality of the claim is, at the moment, being judged by a Trading Standards Officer. In any case, the “study” was not backed by the government as a whole, but just by Peter Hain’s office. It is not even clear that it had ethical approval. The study consisted merely of asking people who had seen an alternative medicine practitioner whether they felt better or worse. There was no control group; no sort of comparison was made. It is surely obvious to the most naive person that a study like this cannot even tell you if the treatment has a placebo effect, never mind that it has any genuine effects of its own. To claim that it does so seems to be simply dishonest. There is no reason at all to think that the patients would not have got better anyway. That is simply not true. It is either dishonest or stupid. Don’t ask me which, I have no idea. This study is no more informative than the infamous Spence (2005) ‘study’ of the same type, which seems to be the only thing that homeopaths can produce to support their case. There is an excellent analysis of the Northern Ireland ‘study’ by Andy Lewis, The Northern Ireland NHS Alternative Medicine ‘Trial’. He explains patiently, yet again, what constitutes evidence and why studies like this are useless. Dee Kyne appears to be CEO of KeepmWell Ltd (a financial interest that is not mentioned). I had some correspondence with Mackereth when the Times (7 Feb 2007) published a picture of the Prince of Wales inspecting an “anti-MRSA aromatherapy inhaler” in his department at the Christie. It turned out that the trial they were doing was not blind No result has been announced anyway, and on enquiry, I find that the trial has not even started yet. Surprising, then to find that the FIH is running the First Clinical Aromatherapy Conference at the Christie Hospital, What will there be to talk about? Much of what they do at the Christie is straightforward massage, but they also promote the nonsensical principles of “reflexology” and acupuncture. The former is untested. The latter is disproven. Roy Welford is a Fellow of the Faculty of Homeopathy, and so promotes disproven therapies. The Glastonbury practice also advertises acupuncture (disproven), osteopathy and herbal medicine (largely untested so most of it consists of giving patients an unknown dose of an ill-defined drug, of unknown effectiveness and unknown safety). Simon Mills is a herbalist who now describes himself as a “phytotherapist” (it sounds posher, but the evidence, or lack of it, is not changed by the fancy name). Mills likes to say things like “there are herbs for heating and drying”, “hot and cold” remedies, and to use meaningless terms like “blood cleanser”, but he appears to be immune to the need for good evidence that herbs work before you give them to sick people. He says, at the end of a talk, “The hot and the cold remain the trade secret of traditional medicine”. And this is the 21st Century. Jane Plant is a geologist who, through her own unfortunate encounter with breast cancer, became obsessed with the idea that a dairy-free diet cured her. Sadly there is no good evidence for that idea, according to the World Cancer Research Fund Report, led by Professor Sir Michael Marmot. No doubt her book on the subject sells well, but it could be held that it is irresponsible to hold out false hopes to desperate people. She is a supporter of the very dubious CancerActive organisation (also supported by Michael Dixon OBE –see above) as well as the notorious pill salesman, Patrick Holford (see also here). Karol Sikora, formerly an oncologist at the Hammersmith Hospital, is now Dean of Medicine at the University of Buckingham (the UK’s only private university). He is also medical director at CancerPartners UK, a private cancer company. He recently shot to fame when he appeared in a commercial in the USA sponsored by “Conservatives for Patients’ Rights”, to pour scorn on the NHS, and to act as an advocate for the USA’s present health system. A very curious performance. Very curious indeed. His attitude to quackery is a mystery wrapped in an enigma. One was somewhat alarmed to see him sponsoring a course at what was, at first, called the British College of Integrated Medicine, and has now been renamed the Faculty of Integrated Medicine That grand title makes it sound like part of a university. It isn’t. The alarm was as result of the alliance with Dr Rosy Daniel (who promotes an untested herbal conconction, Carctol, for ‘healing’ cancer) and Dr Mark Atkinson (a supplement salesman who has also promoted the Qlink pendant. The Qlink pendant is a simple and obvious fraud designed to exploit paranoia about WiFi killing you. The first list of speakers on the proposed diploma in Integrated Medicine was an unholy alliance of outright quacks and commercial interests. It turned out that, although Karol Sikora is sponsoring the course, he knew nothing about the speakers. I did and when I pointed this out to Terence Kealey, vice-chancellor of Buckingham, he immediately removed Rosy Daniel from directing the Diploma. At the moment the course is being revamped entirely by Andrew Miles. There is hope that he’ll do a better job. It has not yet been validated by the University of Buckingham. Watch this space for developments. Stop press It is reported in the Guardian that Professor Sikora has been describing his previous job at Imperial College with less than perfect accuracy. Oh dear. More developments in the follow-up. The role of happy chickens in healing: farms as producers of health as well as food – the Care Farm Initiative Jonathan Dover, Project Manager, Care Farming, West Midlands. Sounds lovely, I wonder how well it works? above). Humana Europe is a private company, a wholly owned subsidiary of Humana Inc., a health benefits company with 11 million members and 22,000 employees and headquarters in Louisville, Kentucky. In 2005 it entered into a business partnership with Virgin Group. Humana was mentioned in the BBC Panorama programme “NHS for Sale”. The company later asked that it be pointed out that they provide commissioning services, not clinical services [Ed. well not yet anyway]. Humana’s document “Humana uses computer games to help people lead healthier lives” is decidedly bizarre. Hang on, it was only a moment ago that we were being told that computer games rewired your brain. It is a mystery to me that a distinguished epidemiologist should be willing to keep such dubious company. Sadly I don’t know what he said, but judging my his publications and his appearence on Natural World, I can’t imagine he’d have much time for homeopaths. This is not the first time that Dame Carol has been comtroversial. 9.45 Integrated health in focus: defeating obesity. Professor Chris Drinkwater, President, NHS Alliance. The NHS Alliance was mentioned above. Enough said. 10.15 Using the natural environment to increase activity. The Natural England Project: the results from year one. Dr William Bird and Ruth Tucker, Natural England. This programme was developed with the University of Westminster’s “Health and Well-being Network”. This group, with one exception, is separate from Westminster’s extensive alternative medicine branch (it’s mostly psychologists). Ruth Chambers, FIH Foundation Fellow. 11.55 Providing self help in practice: Department of Health Integrated Self Help Information Project. Simon Mills, Project Lead: Integrated Self Care in Family Practice, Culm Valley Integrated Centre for Health, Devon and Dr Sam Everington, GP, Bromley by Bow. The Culm Valley Integrated Centre for health is part of the College Surgery Partnership, associated with Michael Dixon OBE (yes, again!). Simon Mills is the herbalist who says “The hot and the cold remain the trade secret of traditional medicine” . Sam Everington, in contrast, seems to be interested in ‘integration’ in the real sense of the word, rather than quackery. How to make sense of the evidence on complementary approaches: what works? What might work? What doesn’t work? 14.15 How to get a PCT or practice- based commissioner to fund your integrated service. A PCT Chief Executive and a Practice-Based Commissioning lead. book? Have they not read the BMJ? Acupuncture is now ell-established to be based on fraudulent principles, and not even to have a worthwhile placeobo effect. STAHCOM seem to be more interested in money than in what works. Sadly it is not stated who the dragons are. One hopes they will be more interested in evidence than the supplicants. Mike Cummings at least doesn’t believe the nonsense about meridians and Qi. It’s a pity he doesn’t look at the real evidence though. You can read something about him and his journal at BMJ Group promotes acupuncture: pure greed. Osteopathy sounds a bit more respectable than the others, but in fact it has never shaken off its cult-like origins. Still many osteopaths make absurd claims to cure all sorts of diseases. Offshoots of osteopathy like ‘cranial osteopathy’ are obvious nonsense. There is no reason to think that osteopathy is any better than any other manipulative therapy and it is clear that all manipulative therapies should be grouped into one. Osteopathy and chiropractic provide the best ever examples of the folly of giving official government recognition to a branch of alternative medicine before the evidence is in. The Council for Healthcare Regulatory Excellence is yet another quango that ticks boxes and fails absolutely to grasp the one important point, does it work?. I came across them at the Westminster Forum, and they seemed a pretty pathetic way to spend £2m per year. Peter Fisher is the last supplicant to the Dragons. He is clinical director of the Royal London Homeopathic Hospital (RLHH), and Queen’s homeopathic physician, It was through him that I got an active interest in quackery. The TV programme QED asked me to check the statistics in a paper of his that claimed that homeopathy was good for fibrositis (there was an elementary mistake and no evidence for an effect). Peter Fisher is also remarkable because he agreed with me that BSc degrees in homeopathy were not justified (on TV –see the movie). And he condemned homeopaths who were caught out recommending their sugar pills for malaria. To that extent Fisher represents the saner end of the homeopathic spectrum. Nevertheless he still maintains that sugar pills work and have effects of their own, and tries to justify the ‘memory of water’ by making analogies with a memory stick or CD. This is so obviously silly that no more comment is needed. Given Fisher’s sensible condemnation of the malaria fiasco, I was rather surprised to see that he appeared on the programme of a conference at the University of Middlesex, talking about “A Strategy To Research The Potential Of Homeopathy In Pandemic Flu”. The title of the conference was Developing Research Strategies in CAM. A colleague, after seeing the programme, thought it was more like “a right tossers’ ball”. Much of the homeopathy has now vanished from the RLHH as a result of greatly reduced commissioning by PCTs (read about it in Fisher’s own words). And the last homeopathy degree in the UK has closed down. It seems an odd moment for the FIH to be pushing it so hard. Stop press It is reported in the Guardian (22 May 2009) that Professor Sikora has been describing his previous job at Imperial College with less than perfect accuracy. Oh dear, oh dear. This fascinating fact seems to have been unearthed first by the admirable NHS Blog Doctor, in his post ‘Imperial College confirm that Karol Sikora does not work for them and does not speak on their behalf‘.